Poonam also sit down beside door and cries, Poonam thinks that i did drama of drinking wine in Priyom’s room so that i can understand Lakhan’s changed behavior so that i can return son back to this family, today i have understood intensity of Lakhan’s love, i understood that when you are angry, you lose control over yourself but the day your anger is lessen, everything will become fine, and i will work for that day now. Its morning, Poonam is sleeping on terrace, Rekha sees her and says i like to see her in pain, how can i leave this golden chance, she comes to Poonam and wakes her up by hitting her with foot, she ask her to get up, Poonam wakes up and touches her feet, Rekha ask her to not drama, what you did that Lakhan threw you out of room, Poonam says nothing, Rekha twists her hand and ask then why you are sleeping outside? if anyone else had seen you sleeping outside then they would have blamed my son, Poonam ask her to leave her as its hurting her, Lakhan opens door and sees Rekha twisting Poonam’s hand, he gets angry and ask Rekha what is happening? Rekha says i was making her understand, Lakhan takes Poonam’s hand from her and says i need to make you understand, listen i dont like to listen lie, Rekha says i didnt lie, ask Poonam, Lakhan says i told you before too that dont come near her, dont irritate her, i think you dont understand my talks, from now on be careful, from today my eyes will be on you, dont try to create problems for her, Poonam looks at him, he says to Poonam that what you are doing here, go inside, Poonam looks at his hand, he is still holding her hand, he leaves it and is embarrassed, he ask her to go inside, she goes in, Lakhan ask Rekha to leave too, Rekha says i thought to ask you what you will have in breakfast but i know what you like, she starts leaving and says its easy to get keys of Haveli but getting keys of Lakhan’s mind is impossible. Poonam comes in room and sees ribbon in cupboard which Lakhan had kept carefully, she recalls how Lakhan said that his favorite color became red due to her red ribbon, i have given place to you in my heart, i used to stand under sun just to see your glimpse, for me it was only you in my life, she smiles and turns to find Lakhan standing there, both share eyelock, she sees ribbon in her hand and takes it from her, he says what you think after yesterday’s night, my heart melted for you, i have forgiven you? no and i have said earlier too that i will do my work myself else Rekha will do it, Poonam says if this is the case then why you stopped Rekha from beating me? Lakhan says because only i have right on you, your happiness, your sadness, your pain everything is mine and no one has any right on it, he pulls her close, she is tensed and ask why you are always in anger? you are always miffed with me or with family, Lakhan holds her face and looks at her. Lakhan pulls Poonam close, Poonam ask why you are always angry? you are either miffed with me or with family, Lakhan holds her face and says you have started to speak alot infront of me, he pushes her away and looks away, he leaves from there, Poonam says if you give me chance to see inside your heart or not but i promise you i will remove this anger layer and show your love to family, like only you have right on me, sameway only i have right on you. Priyom comes in room and finds Bindya sleeping in bed, he sees her bare back and covers it, she wakes up and ask what? i asked you to stay our of room, if i am dancer then will you take advantage of me? Priyom says your mind is not working fine, i have no such thoughts nor i will ever have, Bindya covers herself with blanket and tries to sleep, Priyom creates some noise taking clothes from cupboard, Bindya scold him to let her sleep. Maya starts pooja in mandir, all gather there, Bindya gets angry with bhajan chant and says they cant even let me sleep, she goes down. Bindya comes in mandir and puts water in Maya’s aarti plate, all are shocked, Choti Amma ask what are you doing? Bindya says you are forcing me to do this, why so much noise in morning? from now on there will be no pooja in morning, Choti Amma says we do pooja daily, Bindya says that time i was not in this house but now i wont tolerate all this, Pooja will happen only after i wake up, Choti Amma ask who are you to say all this? Bindya says i am caretaker of this house, my husband is king of Begusarai so i am queen of here and my position is very high so you all have to listen to what i say, did you understand or should i make you understand? Bindya says whole day Badi Amma will remain in this storeroom, nobody will meet her nor talk to her, Maya says but.. Bindya says you must be thinking what she will eat etc.. she will not eat anything and if anyone tries to go against me then he or she will be locked inside storeroom too, if you wanna live in this house then he or she has to follow my orders as they can leave as this is my house, Pinto ask if Badi amma will remain in this storeroom? 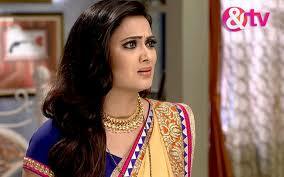 Bindya says no, when you do mistake then your mother punish you right? so when Badi Amma will understand her mistake then i will bring her out of storeroom, she says to everyone that if anyone try to interfere in my matter then i will do such a thing that they will never forget, she starts leaving and thinks that Phulan snatched everything from me and made me cry alot, now its my turn.